Strange Engineering is proud to be celebrating its 50th anniversary in 2014 and wants to show its appreciation to its loyal customers by offering special sales and promotions throughout 2014. 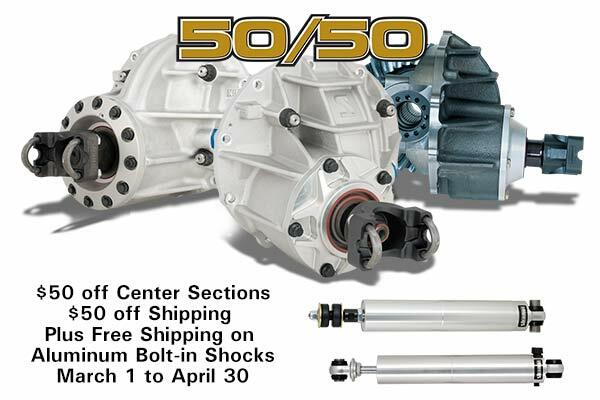 From March 1st to April 30th, 2014, customers can take advantage of a great deal on center sections and aluminum bolt-in shocks. Any complete assembled 9” Ford center section with a spool and pro gear will receive a $50 instant rebate off of each unit purchased. And that’s not all! Each order will also include a $50 credit towards freight charges. This promotion includes the Lightweight Aluminum Case, the Pro Nodular Iron Case, The H.D. Thru-Bolt Aluminum Case, and the impressive Aluminum Ultra-Case. Every assembly with be put together by one of Strange’s highly trained set-up technicians with care and precision. Every assembly will include a Lightweight pro race Chrome-Moly spool that comes with a lifetime warranty. Upgrades include ball bearing pinion supports, micro-blue bearings, magnetic sensor collars, Aluminum 40 spline spools and more. And only high quality pro gears from U.S. Gear, Motive Gear and Richmond are used. Each 9” Ford center section will be shipped in a plastic carrying case to store and ship the unit as needed. Strange Engineering has been the standard in drag race suspension for years. This race proven technology is now available in Strange’s line of bolt-in aluminum shocks. From March 1st thru April 30th 2014 Strange will provide free UPS ground freight on all bolt-in aluminum shocks. These shocks are available in single and double adjustable configurations and are available for most popular domestic applications. Please refer to the application guide on the all new Strange Engineering website to find the shocks for you. Don’t just Race, Race Strange!